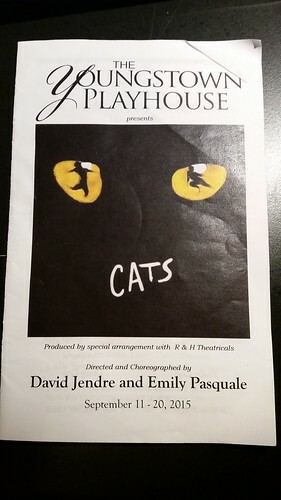 Tonight we took in a performance of Cats at the Youngstown Playhouse, along with two other homeschooling families. It was excellent. S11 has been YouTubing clips of the Broadway show ever since, especially “Mungojerrie and Rumpleteazer”, which she would like to be cast as when she makes her own Broadway debut. O10 was duly impressed by Victoria the white cat. And we all loved the poignant moment when Grizabella was chosen to be reborn to a new Jellicle life. Fun fact- Rum Tum Tugger was played by the same actor we saw as Donkey in Shrek the previous summer: James Major Burns. He is incredibly talented and will be famous someday, we believe.